One might think that having an account in Twitter and Facebook is more than enough. But Google Plus can provide you the most lucrative marketing options than any of these ones! You need to sign up just to find out how! To do this you need to first sign up for a Google Plus account which will help you to create a business page. Below mentioned are some of the easy steps to do it. 1. Move to Google+ for the business page for signing up. 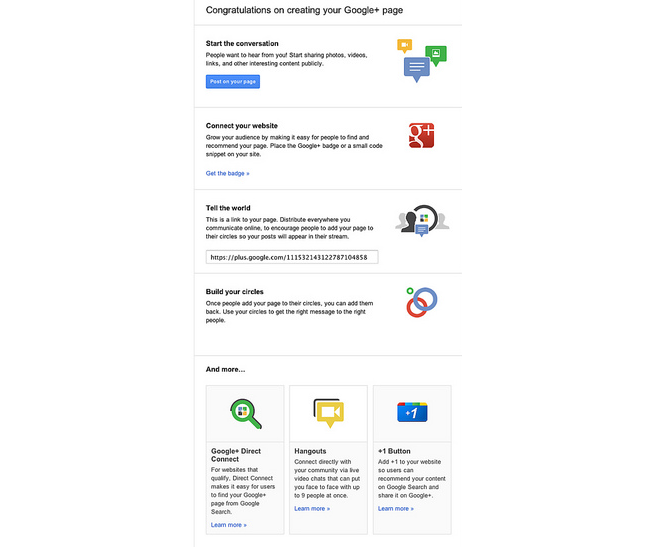 Press on ‘Create your Google+ page’. 2. You can login with your personal Google account. 4. After you have chosen one of the four categories, enter the info that Google asks for. 5. After you have entered the info, add a tagline and profile photo. Don’t skim past this part. For recommendations and good examples of taglines, follow the section below here. 6. 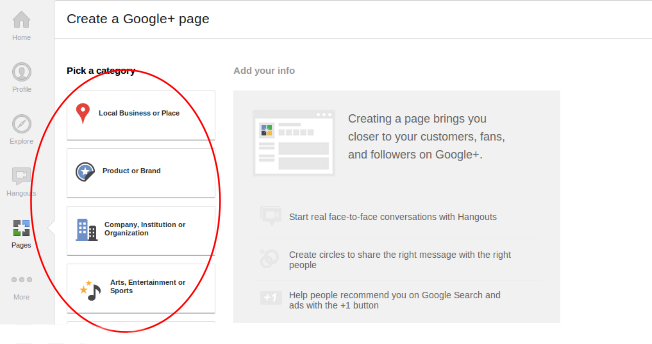 You now have the option to tell your personal Google+ followers about your new page. Benefit of verified Google + name? A verified name proves the authenticity of your page and your business. Its very similar to that of having a verified name on Twitter. As there are no scarcities of fake pages therefore it’s a mandatory option for your authenticity. Do not forget to mention your tagline in Google+. An abstract tagline might not pull the desired traffic. In the business page you will find ‘About’ tab, and see Recommended Links at the bottom. You must add links to your company, blog and homepage. Visuals are always popular on Google+. Therefore most of the time popular posts on Google+ have pictures. People are always very interested to see pictures more than reading. If you want to use cover photo, use some special and unique photo. Avoid using Google’s default picture. The main objective of this is to be more engage with the users. The ones who follow you are mainly interested in your product or your company. You need to provide them the space and liberty to know your activities. Do not always look for options for endorsements but be there to solve their queries and be a part of them. 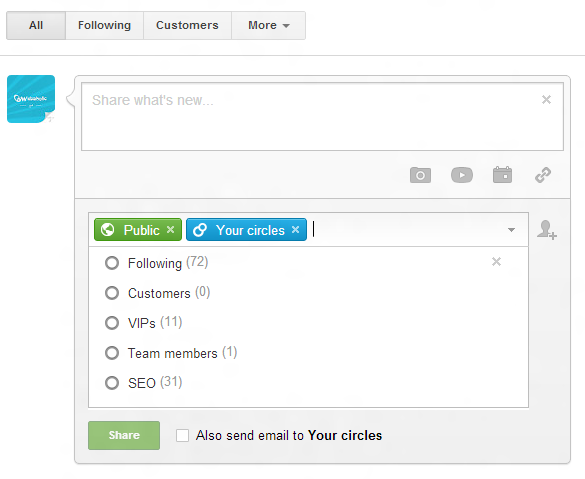 The Circles feature enables the Google+ users categorize their followers and the ones they follow. This helps to send out customized messages to selected people. At the moment you can only do it manually by putting people into a designated circle. Drag and drop the ones whom you follow into desired circles. You can use circles according to your liking. There is no assurance as to all people who are interested in your page or company will be prospective buyers. But you can still make a circle for them post specific messages into it. By doing this you will make the feel valued and moreover you will be able to access whether they like your content and what would be needed to make it catchier. By doing this you will make a customer database of your own and in future would always be of use. 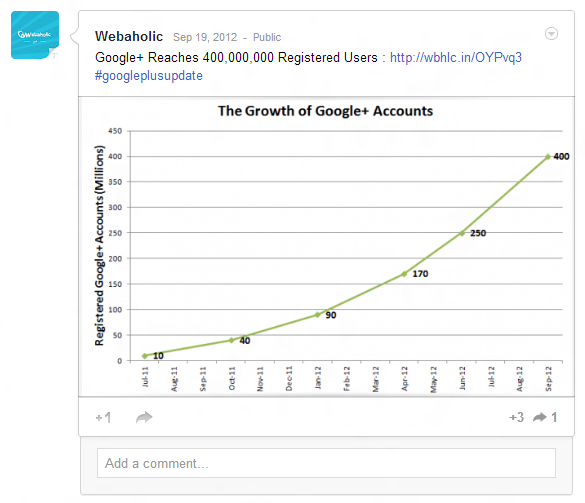 Hangouts are useful for the brands which have an existence on Google+. It provides users a chance to interact with the people who are there in your company or the masters in your field. But if you have a low presence on Google+, it’s virtually useless to join hangouts as most people won’t follow you. Right now only 10 people are allowed to join Hangout, but as and when the demand rises definitely the supply will also grow. The industry to belong to also poses many options for you. Like for example you can always share open discussions with your CEO and the various seminars which takes place in your company. This is act as a window to the world and people will be interested to peep into your world. Hangouts also add a special flavor to your business. Once you join it you will get the results by yourself. It was not long before that Google came up with some tough challenge for Facebook. My opinion for Google Plus is that it is more techno-savvy and as we see the craze among online users for other social media sites, Google plus will also resume the same speed and acceleration. So what are you waiting for? Jump into the pool of whole new world of online marketing strategy with Google plus and see your business grow.